The acclaimed Cypress String Quartet explores three pairings of early and middle Beethoven String Quartets in a series of performances at the Maybeck Studio. In October, paired with Beethoven’s Op. 18 No. 2 and Opus 95, the Salon Series will highlight Schoenberg’s beloved Transfigured Night for which the Cypress will joined by Jonathan Vinocour, principal violist of the San Francisco Symphony, and cellist Jean-Michel Fonteneau, founding member of the Ravel String Quartet. Based on a poem by Richard Dehmel, this expressionist work for sextet explores a transformative experience of love and forgiveness between two lovers walking through the night. This performance is sold out. See other available dates below. The Cypress String Quartet (Cecily Ward, violin; Tom Stone, violin; Ethan Filner, viola; and Jennifer Kloetzel, cello) announces its 2014-2015 Salon Series, which this season takes the quartet to three very different, intimate venues in the Bay Area – the beautiful and historical Maybeck Studio for the Performing Arts in Berkeley, the charming Kanbar Performing Arts Center in San Francisco, and the verdant garden setting of the Woman’s Club of Palo Alto’s Clubhouse in Palo Alto. Salon Concerts run approximately two hours and each will culminate with chocolate and a tasting of exceptional German and Alsatian wines provided by Dee Vine Wines. The Cypress String Quartet’s Salon Series offers audiences the opportunity to experience chamber music in an up-close-and-personal, exhilarating format, with informative introductions to the music given by members of the quartet at each concert. This year, the Cypress explores three pairings of early and middle Beethoven string quartets, coinciding the November 2014 release of the Quartet’s recording of Beethoven’s Middle String Quartets on the AVIE label. In addition to music by Beethoven, each Salon program features a work inspired by the theme of “night.” In October, paired with Beethoven’s Op. 18 No. 2 and Opus 95, the Salon Series will highlight Schoenberg’s beloved Transfigured Night for which the Cypress will joined by Jonathan Vinocour, principal violist of the San Francisco Symphony, and cellist Jean-Michel Fonteneau, founding member of the Ravel String Quartet. Based on a poem by Richard Dehmel, this expressionist work for sextet explores a transformative experience of love and forgiveness between two lovers walking through the night. In February, the Cypress revisits a CSQ commission by Jeffery Cotton entitled Serenade. Cotton, who died in 2013, wrote this evening-inspired work about a fantasy world for the Cypress in 2011 as part of its ongoing Call & Response program. Paired with the Cotton Serenade are Beethoven’s dark and brooding Op. 18, No. 4 and his wonderfully optimistic Op. 59, No. 1. The Cypress String Quartet has added several new recordings to its extensive discography in recent years. 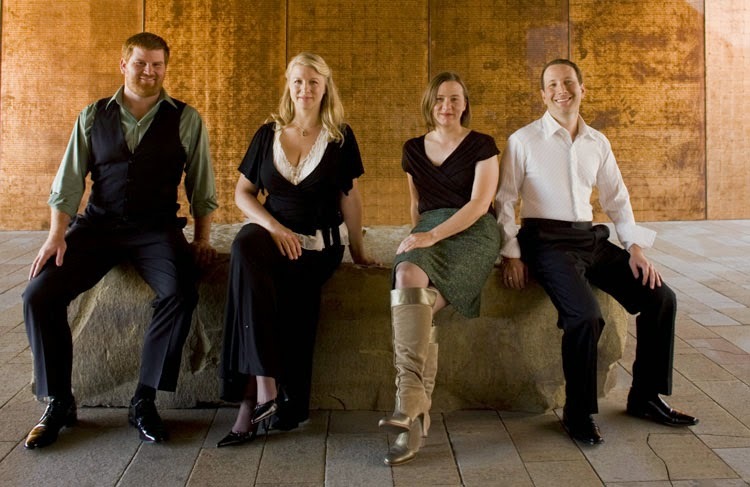 In November 2011 and March 2012 respectively, the Quartet released The American Album and the complete three-CD set of Beethoven’s Late Quartets, which was named Best Classical CD of 2012 by the Dallas Morning News. In February 2013, the Cypress String Quartet added an all-Dvo!ák disc on the AVIE record label featuring Cypresses, B. 152 (the work from which the ensemble draws its name) and String Quartet in G, Op. 106. The album has garnered significant attention and is being featured on Sirius XM and PRI Classical, and was chosen as a CD of the Week on WQXR in New York. Additionally, a full hour was devoted to the new CSQ disc on ORF, the largest and most listened-to classical music radio station in Austria. In May 2014, the Cypress released a recording of Schubert’s String Quintet D956 with cellist Gary Hoffman paired with Schubert’s Quartettsatz D703, also on Avie. The New York Times called the album a "tender, deeply expressive interpretation." The Cypress continues to maintain a busy national and international tour schedule, making appearances on concert series and in venues including Cal Performances, Kennedy Center, Library of Congress, Stanford Lively Arts, Krannert Center, Ravinia Festival, and the 92nd Street Y’s series at SubCulture, a new downtown music venue in New York. Their collaborators include artists such as Leon Fleisher, Jon Nakamatsu, Awadagin Pratt, Gary Hoffman, Atar Arad, James Dunham, and Zuill Bailey. Through its signature Call & Response program the Cypress Quartet commissions and premieres new string quartets from both emerging and celebrated composers, asking them to write in response to established chamber repertoire. Call & Response creates a dynamic dialogue between the past and present, between performers and composers, and among audiences of all ages. The Cypress Quartet’s annual Call & Response concert has earned a strong West Coast following and is preceded by community outreach throughout the Bay Area in public libraries, unorthodox spaces, and schools. In addition, the Cypress frequently tours Call & Response repertoire, bringing these new works to cities across the country. To date, the Cypress Quartet has commissioned and premiered over 30 pieces, four of which were chosen for Chamber Music America’s list of “101 Great American Ensemble Works.” Commissioned composers include Benjamin Lees, Jennifer Higdon, Kevin Puts, George Tsontakis, and Elena Ruehr. A vibrant member of the San Francisco arts community, the Cypress Quartet dedicates itself to reflecting and enriching the city’s cultural landscape through collaborations with the de Young Museum, San Francisco Girls Chorus, and ODC-Dance. As part of its efforts to support and promote Bay Area arts and music, the CSQ self-curates a Salon Series held in intimate, exquisite spaces in Berkeley, San Francisco, and Palo Alto. Now in its third season, the CSQ Salon Series features the masterworks of the string quartet cannon as well as the CSQ commissions. The Cypress Quartet members received degrees from many of the world’s finest conservatories before coming together as a quartet. These include The Juilliard School, Guildhall School of Music & Drama and the Royal College of Music (London), Indiana University, The Cleveland Institute of Music, and the San Francisco Conservatory of Music. After a residency at the Banff Centre and a fellowship at the Center for Advanced Quartet Studies of the Aspen Music Festival, the Quartet coached intensively in London with the Amadeus Quartet. Cypress members count the Cleveland and Juilliard Quartets as some of their greatest influences. The members of the Cypress Quartet play exceptional instruments including violins by Antonio Stradivari (1681) and Carlos Bergonzi (1733), a viola by Vittorio Bellarosa (1947), and a cello by Hieronymus Amati II (1701). The Cypress Quartet takes its name from the set of twelve love songs for string quartet, Cypresses, by Antonin Dvorák. For more information, visit www.cypressquartet.com.